Russia and the US have traded blame at a special UN Security Council meeting on Syria in New York. An attack on an aid convoy near Aleppo on Monday left at least 20 people dead and the shaky Syrian ceasefire in tatters. Russia has categorically denied involvement and is calling for a “thorough and impartial” investigation of what happened. Calling the attack “a flagrant violation of international law,” the US is calling for a no-fly zone to be brought in immediately. What is happening on the ground in Syria? Agencies report that Syrian rebels and pro-government forces are battling each other along major front lines near Aleppo and Hama. Air strikes have reportedly killed at least a dozen people, including four medical workers. The renewed fighting demonstrates the slim prospects for reviving the truce that collapsed into fresh fighting and bombardments on Monday. US officials believe an attack on an aid convoy on Monday was carried out by Russian jets. At least 20 civilians died in what witnesses have described as an aerial attack on a humanitarian convoy of aid lorries near Aleppo. The Syrian Red Crescent says the head of its local office was among those killed. There has been furious international condemnation. Both Russia and Syria insist their forces were not involved. Late on Wednesday, the UN announced it will resume aid convoys in Syria after they were suspended in the wake of Monday’s attack. Speaking about the attack earlier in the week, outgoing UN Secretary General Ban Ki-moon’s language was unusually blunt. “Powerful patrons, feeding the war machine, also have blood on their hands,” he said. The UN suspended all aid convoys in Syria in the wake of the attack. Speaking at a UN Security Council high-level meeting on Syria on Wednesday, Special Envoy Staffan de Mistura insisted the conflict would not be resolved militarily. The Russian Defence Ministry says a US Predator drone was in the same area as the aid convoy. Noting that the drones carry air-to-ground missiles, spokesman Major-General Igor Konashenkov said it took off from Incirlik air base in Turkey. “Only the drone’s owners know what it was doing there at the necessary moment and what tasks it was carrying out,” Konashenkov said in a statement. He added that Moscow is not drawing any conclusions about the drone. Konashenkov repeated denials of Russian involvement. He suggested Western allegations that Moscow was directly or indirectly responsible are an attempt to distract attention from the US-led coalition’s deadly bombing of Syrian soldiers in Deir-el-Zor last Saturday. Speaking at the UN Security Council high level meeting on Wednesday, Sergei Lavrov said a ceasefire brokered with the US on September 9 will only work if there is a comprehensive approach with simultaneous steps taken by all parties involved in the conflict. “The strikes on the 16th of September by the coalition against the government positions in Deir el- Zor were a clear violation of the cessation of hostilities and, immediately after those strikes, ISIL began assaults against the government forces,” Lavrov told the Security Council. Speaking at the UN Security Council special briefing on Wednesday, the US Secretary of State called for an immediate no-fly zone to be brought in. 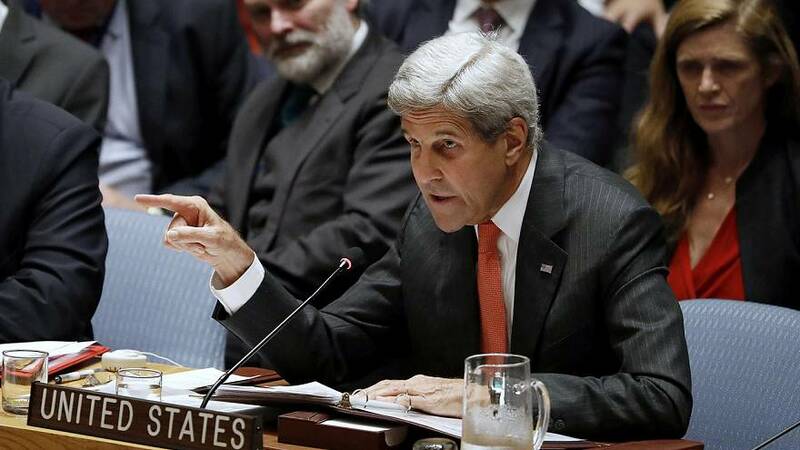 John Kerry said all aircraft in “key areas over Syria” must be immediately grounded. Monday’s attack, along with a second attack on two ambulances on Tuesday, are “flagrant violations of international law,” Kerry added. However, Kerry says he still believes there is a way forward “out of the carnage” in Syria. He also urged all countries to stop supporting any parties trying to sabotage the ceasefire agreement. “This attack has dealt a very heavy blow to our efforts to bring peace to Syria and it raises a profound doubt about whether Russia and the Assad regime can or will live up to the obligations that they agreed to in Geneva,” Kerry told the Security Council. Late on Wednesday afternoon, the US denied Russia’s claim that a coalition drone was near the Syrian aid convoy that was hit on Monday.